Saturday saw the family taking a quick trip for a shopping spree…a quick three hour drive to the Sydney’s IKEA Store…what a blast, there were so many wonderful things to see and so many extra things I could have bought…lots of colours, textures and unique Christmas decorations. With courage I walked out of the shop, (not to say I didn’t buy from other shops..LOL! )with only my gifted lead pencil to write items on my long,long wish list. However one of the items my sister purchased for her living room were these magnificent paper stars…they beam such beautiful light. I so love the reflection of the tiny stars in the windows. 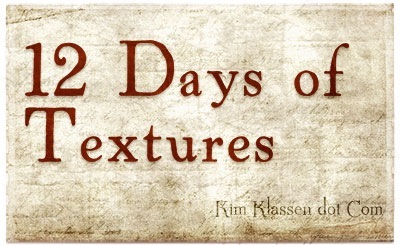 Another wonderful texture from Kim Klassen – KKzuzu. I’m been working with Photoshop, learning and developing new skills and this one my friends is challenging. So much to understand and learn. I’m happy with today’s textured photo. Well, my friends we’re counting down..one week to go. I hope to now proceed to the kitchen, and with apron and Christmas spirit make some Christmas clatter of pots and pans. 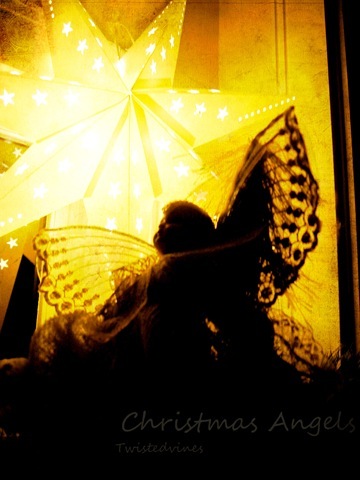 I love the image of the angel gazing up at the star. Just precious, Yvette! I like how you are always up for a creative challenge, and come through like a bright star (pun intended). Lovely photo. Beautiful image, Yvette. It takes about an hour to get to this area’s Ikea, thankfully. Any less and I’d be there all of the time! Oh Ikea, how I love thee. Fortunately or unfortunately I don’t have one anywhere near me. Merry Christmas and may your creative juices flow each and every day of 2012. Actually we were pleasantly surprised, not too many people at all, I guess with the first weeks of holidays, families were already packed ready to go on Summer vacation…we even had the trailer on and thought we might not get a parking…but surprisingly we sailed in. We had a wonderful relaxed walk around and got lost for the afternoon amongst it all!